Garda Ciarán O'Shea: [Touching the seemingly dead alien species] It's dead, right? Dr. Adam Smith: Ummm, I'm not sure. Garda Ciarán O'Shea: [Moves away cautiously] You're not what? Dr. Adam Smith: Basic tests I've done so far have shown up nothing usual or normal. It is beyond mystifying. I mean, really, I can't be sure without opening it up. Paddy Barrett: [Swiftly beats it with a stick; it doesn't move] Ah... Tis dead. Never Mind The Graboids Here's The Grabbers. 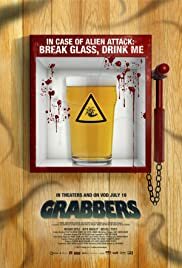 Grabbers directed by Jon Wright and written by Kevin Lehane. 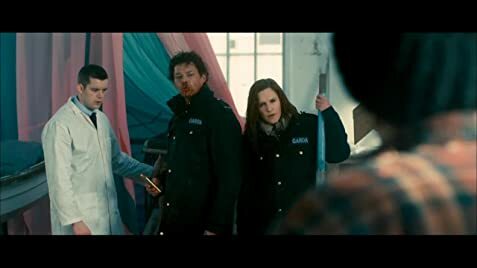 It stars Richard Coyle, Ruth Bradley, Russell Tovey and Lalor Roddy. Music is by Christian Henson and cinematography by Trevor Forrest.